A numbers chart is a table that lists the numbers in numerical order (e.g. 1-10 first line, 11-20 second line). 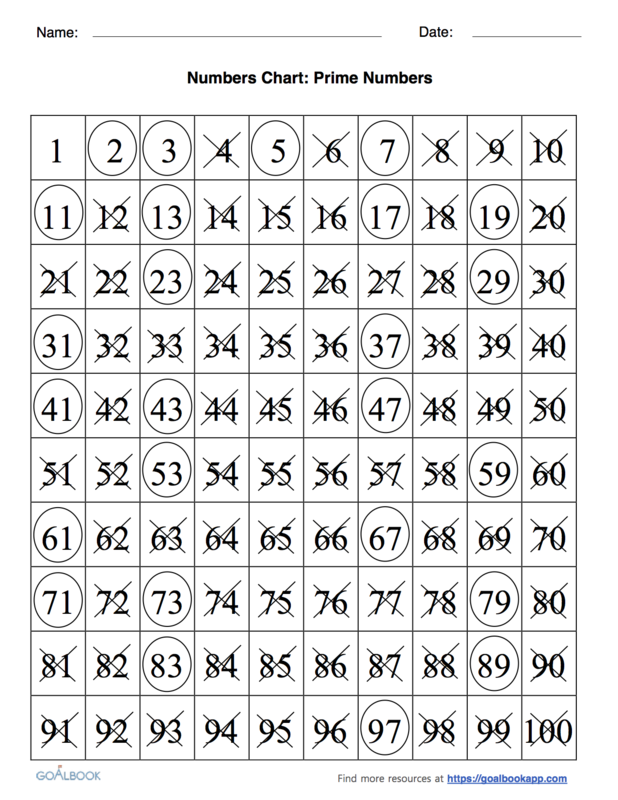 There can be different kinds of specific numbers charts, such as a hundreds chart which contains the numerals from 1–100. 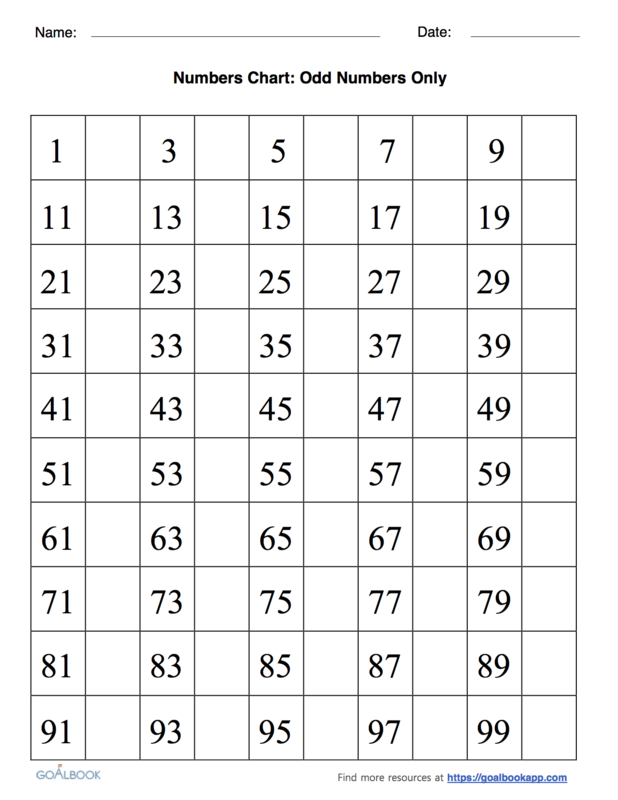 These charts can help students identify numerals and the numerical order as well as establish patterns within the numbers (e.g. even numbers, counting by fives, tens, etc.). The numbers charts may only have the written numerals or may contain the numerals with a picture representation of the number of objects with each numeral (see above). Numbers chart with numbers 1 to 20. Includes pictures to represent each number. Numbers chart displaying even numbers up to 100. 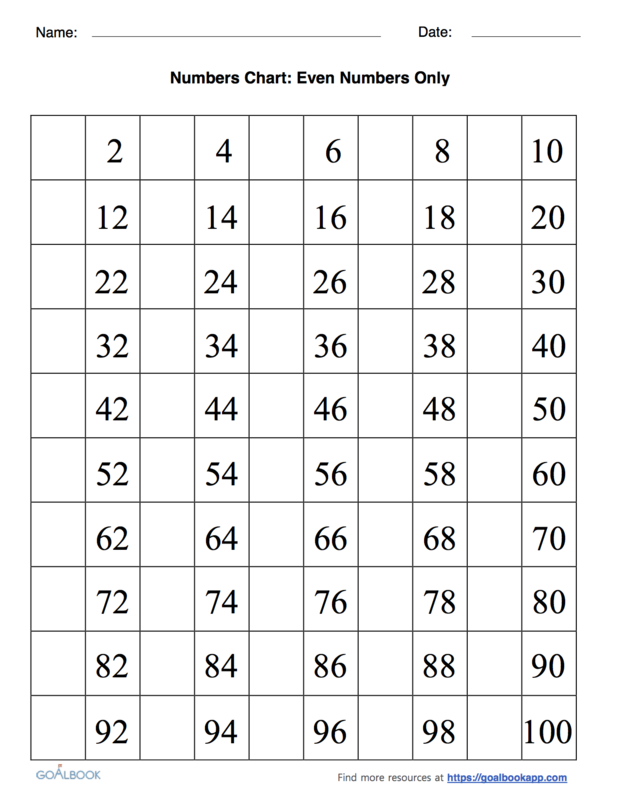 Numbers chart displaying odd numbers from up to 100. 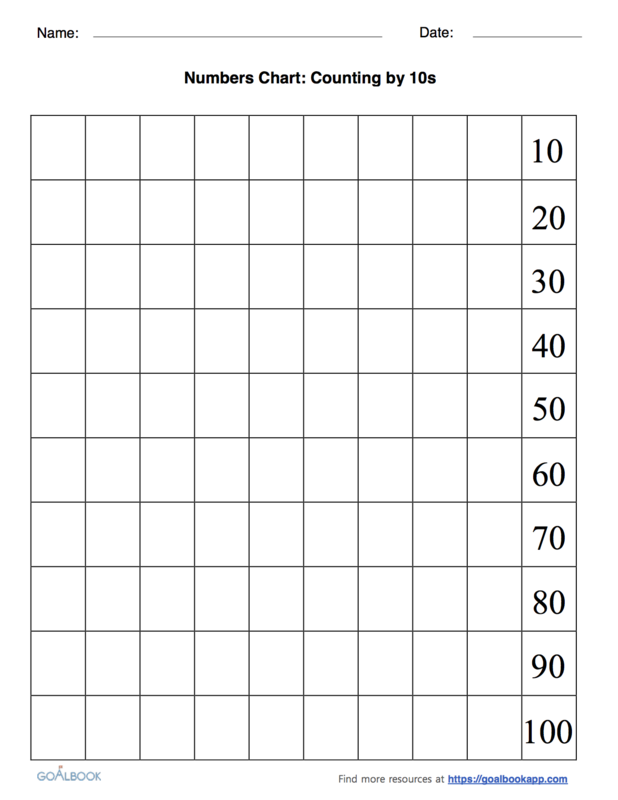 Numbers chart displaying multiples of 5 up to 100. Numbers chart displaying multiples of 10 up to 100. 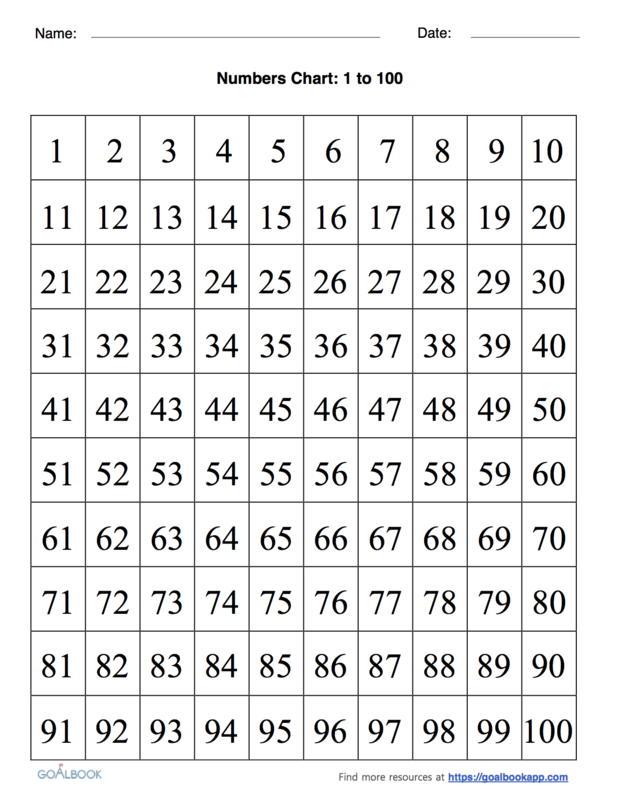 Numbers chart highlighting all prime numbers between 1 and 100. 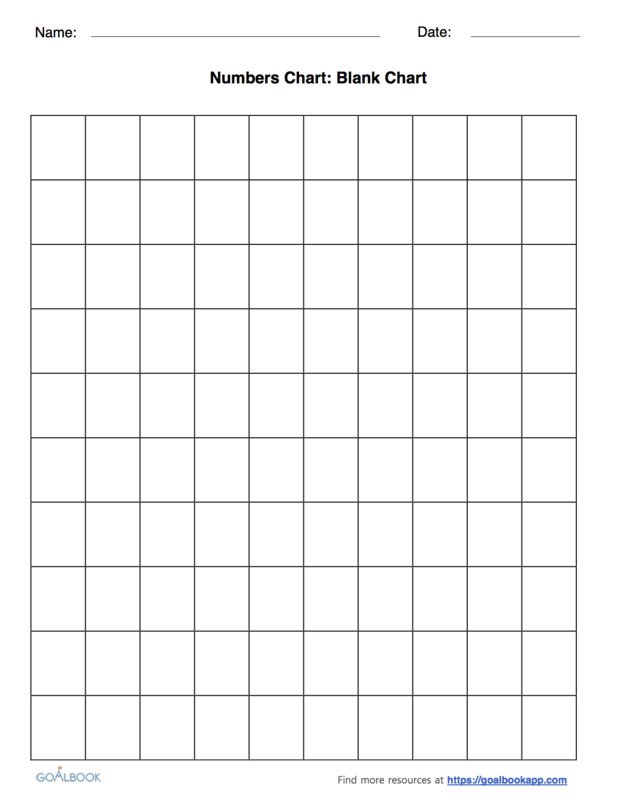 Blank 1 to 100 numbers chart. A set of charts counting to 100. Includes a chart with numbers and words. Hundreds charts can be used in a variety of ways to help students access and differentiate math concepts. 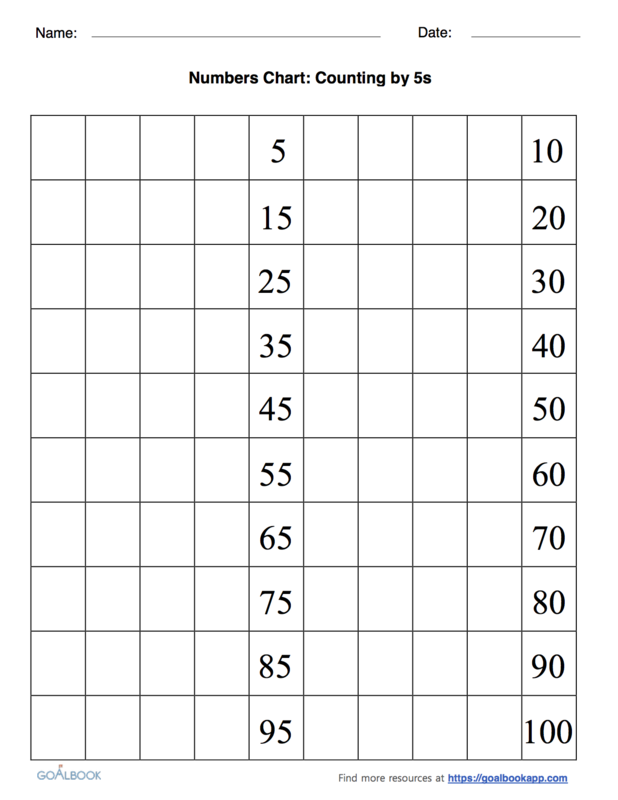 For example, a student can use a hundreds chart for adding/subtracting with a moveable object, adding money (counting by 5’s, 10’s, 25’s with nickels, dimes and quarters), and learning multiplication and factorization patterns. 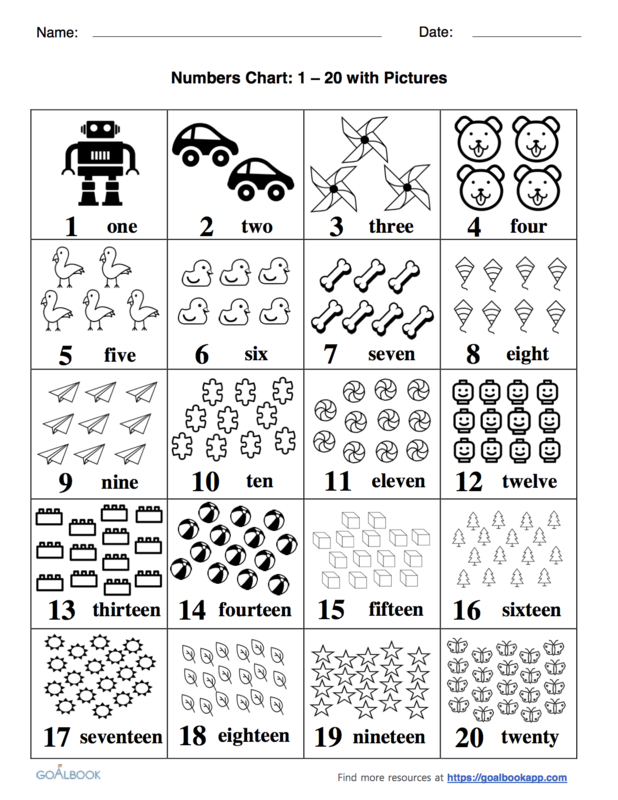 Numbers charts can be found at educational stores such as [[ http://products.lakeshorelearning.com | Lakeshore Learning ]] or can be created by the teacher or student. For a student who is non-verbal, having a simple AAC device such as the [[ http://www.mayer-johnson.com/gotalk-20 | Go Talk 20+ ]] with numbers 1-20 preprogrammed may help the student with counting objects and identifying numerals. The whole class can also use the device during small group math instruction. A class is learning how to count objects using 1:1 correspondence and learning how to read/identify the numeral in word form. The teacher has a numbers chart with picture objects posted and has the students come up to identify the numeral after counting objects. A student is learning how to skip count by fives and uses a hundreds chart with the fives and tens columns highlighted to learn to count by fives. Student is learning about factoring and prime numbers. Student has a hundreds chart with prime numbers highlighted. Student refers to the numbers chart to learn about factoring and prime factorization.